[Seite 290] der achte, Hom. ll. 7, 223 u. Folgde. ὄγδοος: -η, -ον, (ἴδε ἐν λέξ. ὀκτώ), ὡς καί νῦν, Λατιν. octavus, Ὅμ., κλ. : ὀγδόη (ἐξυπακ. ἡμέρα), ὀγδόῃ Πυανεψιῶνος Πλουτ. Θησ. 36. [ὄγδοον ὡς δισύλλ., Ὀδ. Η. 261]. - Ὄγδοος, μὴν Φωκέων, ἀντιστοιχῶν τῷ Δελφῶν Ἡρακλείῳ, Ἐπιγρ. Δελφῶν, W. et F. 82. 222.
from ὀκτώ; the eighth: eighth. ὀγδη, ὀγδον (from Homer down), the eighth: our who has seven other companions, who with others is the eighth, δέκατος, with nine others, Matthiae, § 469,9; Viger. edition, Herm., p. 72 f and 720f; Winer s Grammar, § 37,2; (Buttmann, 30 (26)). ὄγδοος: -η, -ον (ὀκτώ), όγδοος, Λατ. octavus, σε Όμηρ., κ.λ. ὄγδοος: восьмой Hom. etc. : ὀγδόῃ (sc. ἡμέρᾳ) Πυανεψιῶνος Plut. в восьмой день месяца пианепсиона. 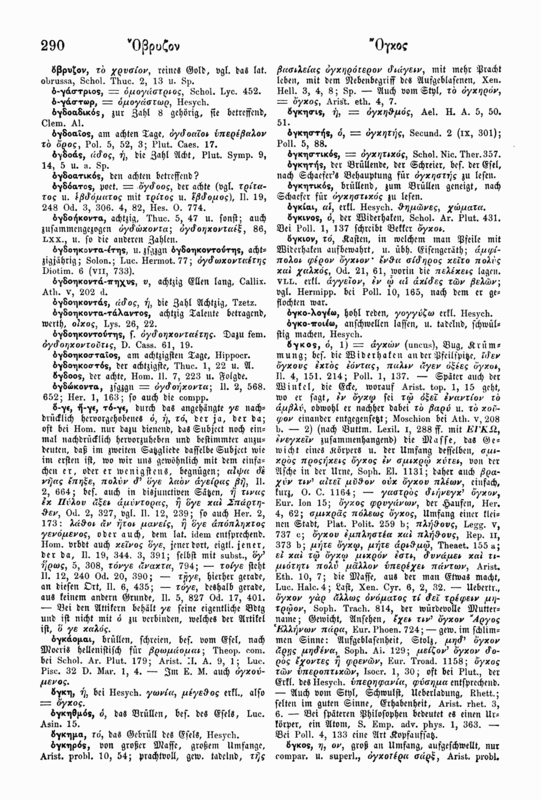 Other forms: ὀγδόατος (Il. ; after τέτρατος etc.). Compounds: As 1. member prob. in ὀγδόδιον θυσία παρ' Ἀθηναίοις τελουμένη Θησεῖ H., prob. prop. of a sacrifice brought "on the eighth day"; cf. αὑτόδιον w. lit. and Sommer Nominalkomp. 47 n. 1. Derivatives: Deriv. ὀγδοαῖος appearing on the eighth day (Plb., Plu.). On ὀγδοάς, -ήκοντα etc. s. ὀκτώ. Origin: IE [Indo-European]  *h₃eḱt- eight. Etymology: From *ὄγδοϜος (oldcor. [ὀγ]δόϜα), perhaps to ὀκτώ after the example of ἑπτά : ἕβδομος (s. v.). Sommer Zum Zahlwort 24f. considers also the possibility of a regressive voice-assimilation in *oḱtu̯-os as in ἕβδομος from *septm-os, both with anaptyctic -ο-. A zero-grade -u-, -u̯- beside the long diphthongue in ὀκτώ (IE *oktōu̯) has also been supposed in Oldphryg. οτυϜοι Ϝετει in the eighth year and Goth. ahtuda ὄγδοος'. Diphthonges are also found in OHG ahtow-i pl. eighth as office and in the lengthened grade Lat. octāvus (with unclear ā). Details in Schwyzer 595 w. n. 3, Sommer l.c., W.-Hofmann s. octō. Cf. Rix, Hist. Gr. 172: *(h₃)eḱth₃u-h₂o-. eighth, Lat. octavus, Hom., etc.